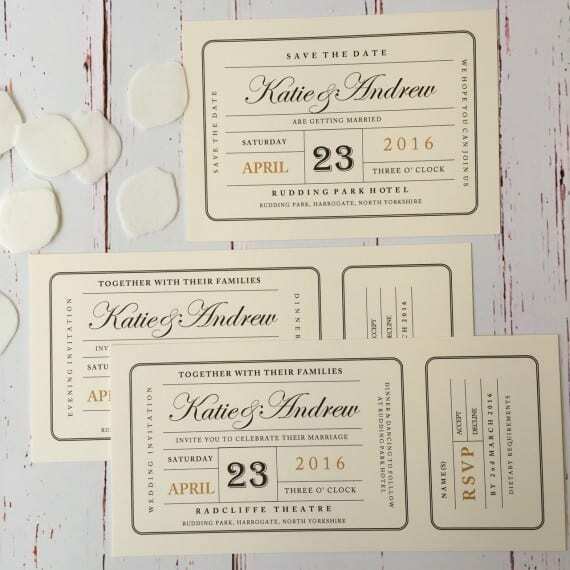 Set the theme of your wedding from the offset with these Grey Blossom Wedding invitations. You can personalise them with your names, date, venue, time etc. (see customisation bar below) or alternatively you can send us your details and we can do it for you and email you a draft for approval. Your wedding stationery will then be printed onto high quality A6 card with quality envelopes to match. You might also want to consider other wedding stationery items. For example, Wedding Reception Evening Invitations for guests that are invited to the evening celebrations only. An Information Card is also a good idea to let your guests know important details about the day such as accommodation arrangements and transport. RSVPBY 1st NOVEMBER 2018NAMES/S .................................................. ACCEPTS ......... REJECTS..........ANY SPECIAL DIETARY REQUIREMENTS ..................................................................MY SONG REQUEST ................................Email Anna@wedding.com or Tel 0777177007 Or you can post this card please turn over. 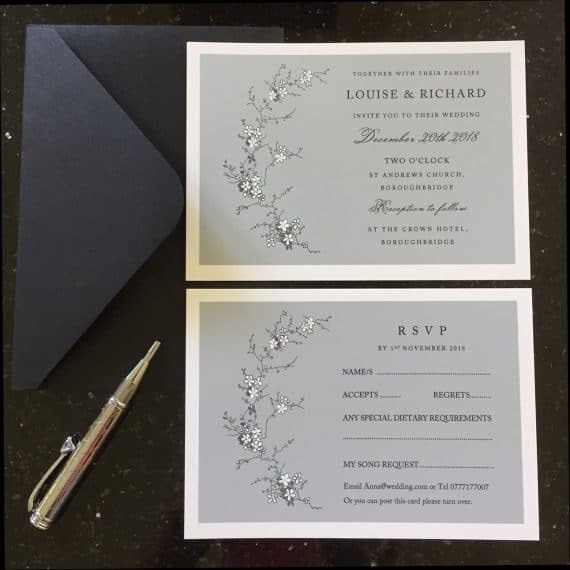 Set the theme of your wedding from the offset with these stylish grey blossom wedding invitations. We will personalise them with your names, date, venue, time etc. 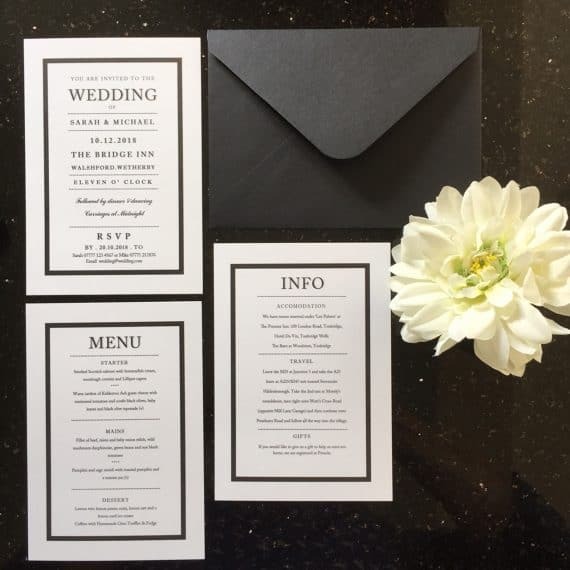 Your wedding stationery will then be printed onto high quality A6 card with quality white or black envelopes. Once you have purchased the number of invitations required we will send you an email requesting all your details. We can discuss the options and the combinations of card/invitations required. We will then email you a draft invitation for your approval before printing. It is important to check the details (capitals, punctuation, spelling etc) and ensure you are happy with the draft invitation before we commit to printing. At this stage we can make any necessary changes and then we will arrange the printing and dispatch your invitations ASAP.